Hook that Bait, It’s Ice-Fishing Season in Alaska! This photo is used under a Creative Commons license by Vince Alongi. Alaska and fishing go together like Texas and barbeque or Hawaii and surfing, and we like to fish year round! Alaska’s winters offer up some of the most beautifully sunny, clear days; perfect for bundling up and hanging out on a frozen lake with a thermos of hot coffee, waiting for dinner to take the bait. To show you what we mean, we gathered some tips and tricks to make your next ice fishing experience in Alaska one to remember. First, some tips for staying warm and safe. In Alaska, layers are key for staying warm! Especially if you will be trekking longer distances to your fishing destination by foot and may work up a sweat along the way. Wear plenty of clothes and pack some extra dry ones just in case. Next, know where you’re going and watch your step. Walking on a frozen lake or river can be risky so it’s essential that you check the thickness of the ice before stepping foot on it. 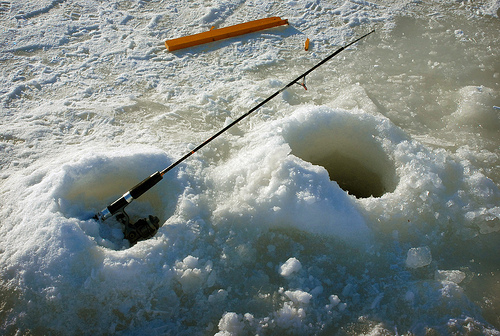 A recommended 5 or 6 inches of ice is needed to support the weight of foot traffic and fishing equipment. Drilling your fishing holes can be the toughest challenge without the right gear. The best way to drill down through the ice is to use a gas-powered or manual auger. Try a spud bar to bust through an old fishing hole that has frozen over. And last but certainly not least, we recommend checking in with local fishing outfitters or the Alaska Department of Fish and Game for tips on bait and where the fish are biting. Now you’re ready to fish! Thanks to a special program through the Alaska Department of Fish and Game, the most actively fished lakes are supplemented with live fish stocks each year. Information about these lakes can be found on the Lake Fish Info webpage. Use this link to easily find maps, average lake depths, the types of fish populating each lake and more useful info to help navigate you for your next big catch. Each year in Anchorage around late January or early February, Swim Like A Fish Foundation hosts the weekend Jewel Lake Ice Fishing Jamboree. All the fishing holes for the event are pre-drilled and kept open by volunteers, and fishing poles and bait are provided free of charge. This two-day event is open to all so grab your family and friends and test your luck on the lake next year. Hot chocolate and sweet snacks are also provided. If this all sounds fun but the cold weather is a deal-breaker, Princess Alaska Lodges provides guests with a variety of fishing expeditions at their Kenai, Denali, Copper River and Denali locations all summer long. From jet-boat fishing to fly fishing, Princess Alaska Lodges’ tour desks provide a variety of fun fishing activities tailored to provide the trip of a lifetime.